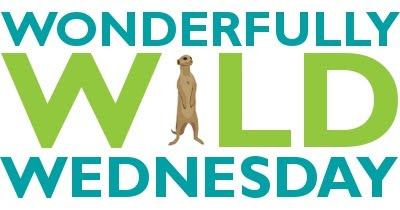 Wonderfully Wild Wednesday: Sing it! Early in the morning, the tropical rain forest usually resonates with "singing" siamangs whose call is so loud it can be heard for up to 3 miles. How can they project so far? That hairless throat pouch blows up to act as a resonator that enhances the carrying of their call. Photo by Dennis Conner/Woodland Park Zoo. 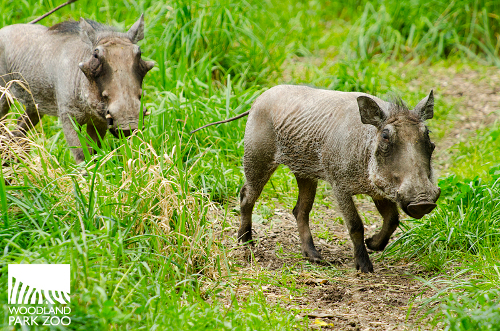 We’re just a little over a week away from officially debuting two species of wild pig at the zoo on May 5 and 6—Visayan warty pigs and African warthogs. 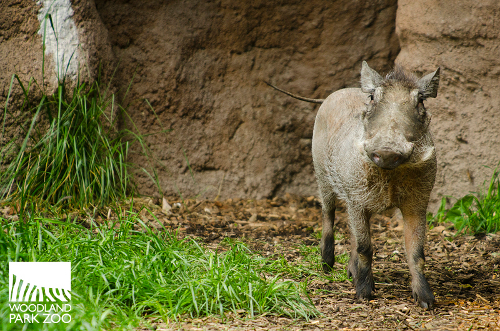 Warthogs have moved into the zoo's African Savanna biome. 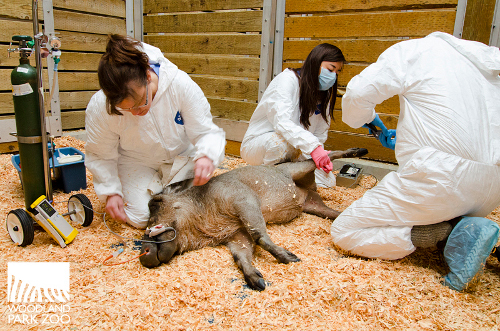 When new animals arrive at the zoo, they go through a standard 30-day quarantine. Our newly arrived 1-year-old brother and sister warthogs—who came to us from Zoo Atlanta—are wrapping up their quarantine now and have just been introduced to their exhibit space so they can begin to acclimate to their new surroundings. But a big step for them before they could enter their exhibit space in the African Savanna was to head off to the vets for a health check-up in order to be cleared from quarantine. 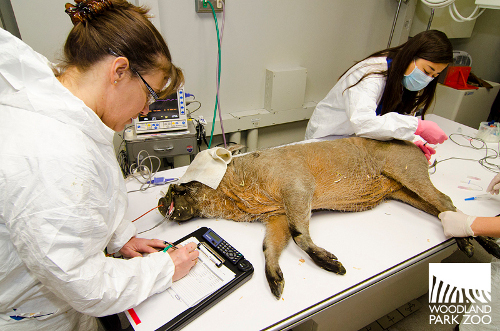 Female warthog gets her check-up by our Animal Health team. 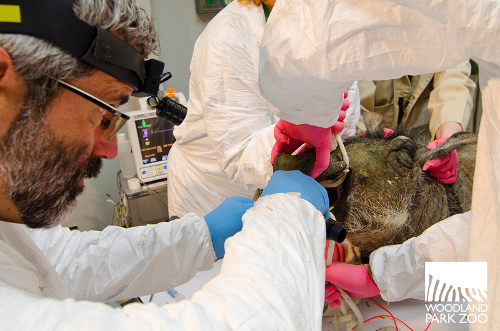 The warthogs recently completed their quarantine exams and got clean bills of health. The two were weighed, had x-rays taken and blood drawn, and were closely inspected to register the condition of their teeth, skin and other body parts. A quick dental inspection for the female warthog. Getting all of this baseline data when they arrive is critical so we can track their growth and any changes in their health over the years. The male warthog (pictured above) weighed in at just over 130 pounds—on the small end for a warthog, but typical for a pig of his age. Male warthogs can grow to as big as 330 pounds. Our little guy has a lot more grass, roots, tubers and hay to eat before he gets there. Warthogs explore their new exhibit space. A group of wild pigs is called a sounder, and our sounder proved to be healthy and is adjusting well. They finished up their quarantine and took their first steps inside their exhibit just this past week, where they’ll have to learn through experience about their new surroundings including testing some boundaries and checking out the terrain. Their exhibit space—the former African wild dog exhibit—is designed to evoke the arid savannas of East Africa to which they are native. 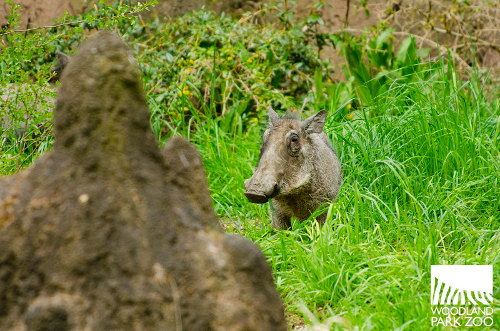 The official debut of the warthogs and our other new wild pigs, the Visayan warty pig, is Sat., - Sun., May 5 and 6. Opening weekend festivities will include free piggy banks at the ZooStores for the first 500 kids (ages 12 and under) each day, pig keeper talks, and special pig-themed programs in Zoomazium. We hope you’ll go hog wild with us! All photos by Ryan Hawk/Woodland Park Zoo. 4/27 UPDATE: If you are having trouble getting www.zoo.org to load, you can buy your tickets directly at this link. BECU ZooTunes presented by Carter Subaru is a major source of revenue for the zoo’s mission. Proceeds from ZooTunes support the zoo’s quality animal care, engaging education programs and wildlife conservation. Additional sponsorship support for BECU ZooTunes presented by Carter Subaru is provided by: KMTT 103.7 The Mountain and The Seattle Times. Tickets go on sale beginning April 27 at 8:00 a.m. online at www.zoo.org/zootunes, with a limited number of tickets available at zoo entrances during operating hours. Which shows are you excited about? We hope to see you on the North Meadow this summer! 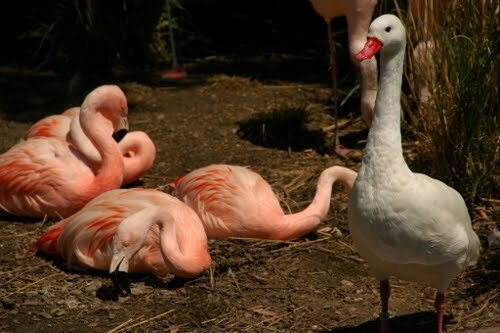 While many visitors think this animal is a goose that has taken up residence in the flamingo exhibit, this is in fact the Coscoroba swan, native to South America and known to fly with flamingos during migration in the wild. Springtime penguin chicks and one lucky egg! 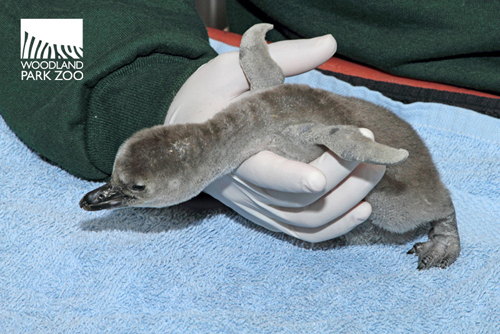 A fuzzy Humboldt penguin chick stretches out during a check-up with keepers. Photo by Dennis Dow/Woodland Park Zoo. 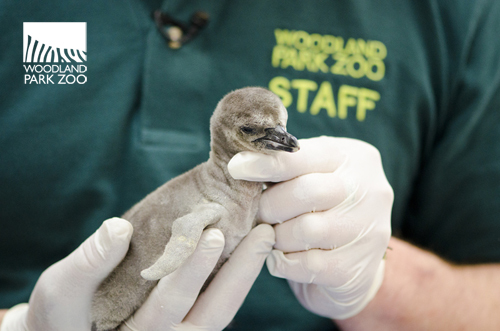 What is more adorable than a penguin chick check-up? 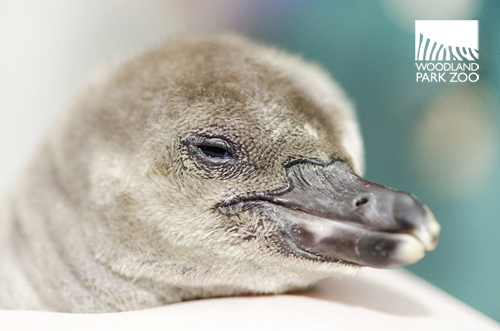 It’s tough to think of anything more wonderful to celebrate springtime than a couple of fuzzy, gray additions to our Humboldt penguin colony, especially the story behind one of these very lucky chicks! Up close with a penguin chick. Photo by Ryan Hawk/Woodland Park Zoo. 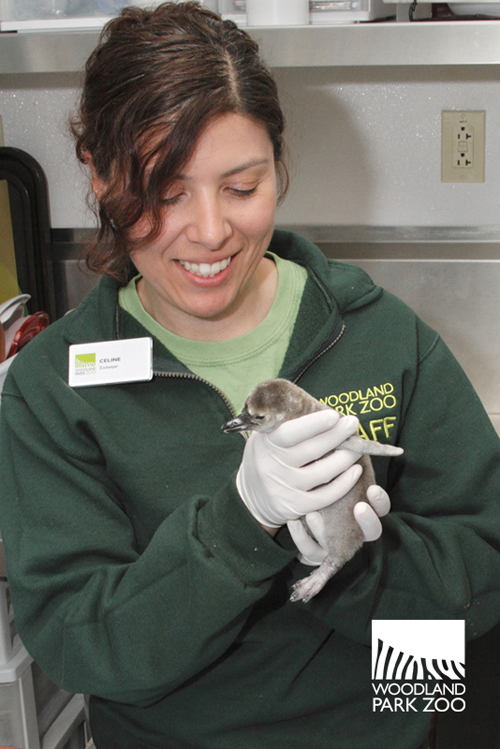 Two little penguin chicks received their first weigh-in and visual health assessment yesterday behind the scenes at our award-winning Humboldt penguin exhibit. Keepers John and Celine carefully weighed and checked each penguin chick, the first two of this year’s penguin breeding season. These desert penguin chicks weighed in yesterday at 9 oz. and 11 oz. 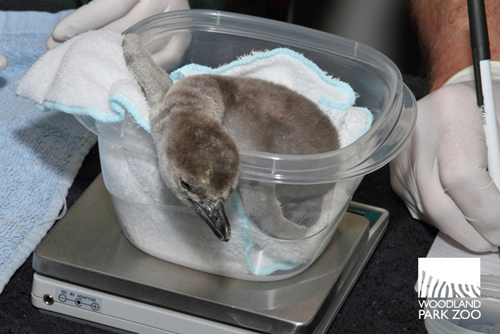 Penguin chick on the scale! Photo by Dennis Dow/Woodland Park Zoo. 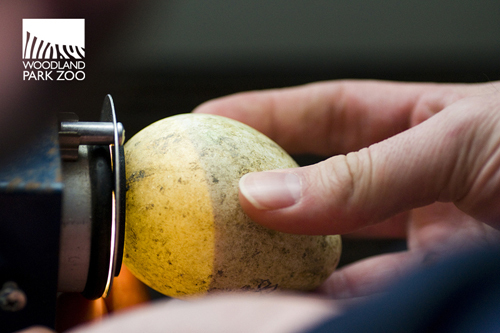 Here you can see a penguin egg being candled. Keepers use a special light to look through the shell to check on the growth of the chick. Photo by Ryan Hawk/Woodland Park Zoo. The first chick hatched on April 3 to 4-year-old mother Sardinia and 9-year-old father Groucho. While the first egg was just hatching, a young visitor alerted the keeper that he could see a second egg on a cliff in the exhibit! The keeper, Celine, immediately followed the boy’s instructions and scooped up the egg. The egg was relocated under a pair of foster parents where it proceeded to hatch a couple of days later on April 5! We’re now asking for everyone’s help to find the little boy who spotted the egg. We’d love to find him to properly thank him for his keen observation and help in rescuing the lucky egg. If anyone knows this mystery boy, please contact the zoo by emailing: woodlandparkzoopr@zoo.org. 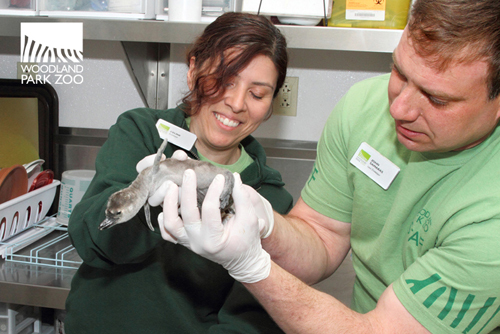 Keepers, Celine Pardo and John Samaras, do a visual check of a very wiggly new penguin chick! Photo by Dennis Dow/Woodland Park Zoo. Both chicks will now spend time nesting in their cozy burrows. The chicks hang out with their parents (and foster parents), who take great care of them, feeding, cleaning and keeping them warm. Keepers try to minimize staff intervention, but they do measure weight gain to make sure the tiny penguins are getting enough to eat. Keeper John Samaras holds one of the new penguin chicks. Photo by Ryan Hawk/Woodland Park Zoo. Before the new chicks reach fledging age and go outdoors on exhibit, they will be removed from the nest so keepers can condition the birds to approach staff for feeding and other animal care activities. The growing chicks will have round-the-clock access to a shallow pool where they can practice their swimming, flying and twirling in a less crowded environment. Humboldt penguins have a body made to swim. They use their strong wings to literally “fly” underwater, usually just below the surface. The penguins use their feet and tail to steer at speeds of up to 20 miles per hour! 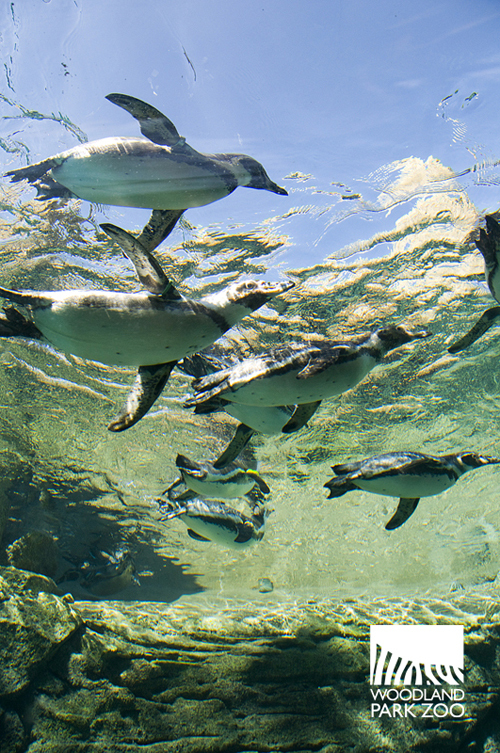 Penguins dive and fly through our award winning exhibit. Photo by Ryan Hawk/ Woodland Park Zoo. Four additional eggs are expected to hatch between April 16 and 26. You’ll be able to visit these chicks when they join the larger colony of penguins in the outdoor exhibit sometime by mid-summer! Last year, as part of Woodland Park Zoo’s continuing effort in the conservation of Humboldt penguins, keeper John Samaras had the opportunity to travel to Punta San Juan in Peru and take part in an annual health assessment of the wild population conducted by zoo professionals and Peruvian biologists. Unlike their ice and snow-dwelling Antarctic cousins, Humboldt penguins inhabit hot, dry coastlines. Woodland Park Zoo’s penguin exhibit, which opened in May 2009, mimics the coast of Punta San Juan, a barren desert peninsula that juts out into the South Pacific in southern Peru. You can read more about these endangered birds and John’s adventures in Peru here. 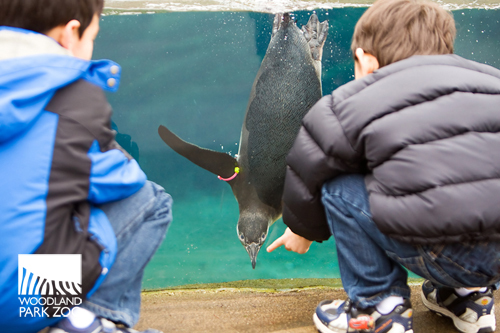 Young visitors get a close-up welcome from one of our curious penguins. Photo by Mat Hayward/Woodland Park Zoo. 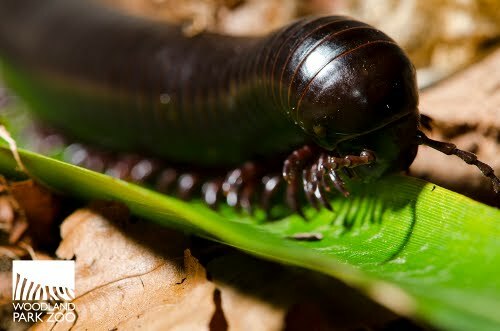 Although their name literally means "thousand-legged," most millipedes have no more than 300 legs. Millipedes have two pairs of legs per body segment, and a mature millipede averages about 40-60 segments. 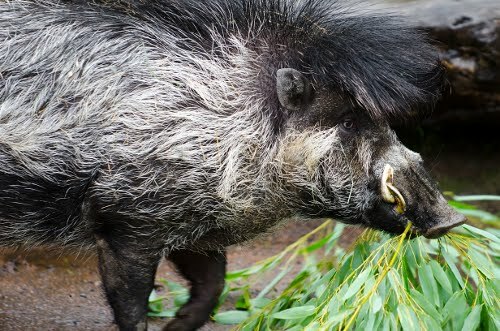 Visayan warty pig at Oregon Zoo. This species of wild pig is coming to Woodland Park Zoo in May. Photo by Ryan Hawk/Woodland Park Zoo. This summer, two species of wild pig are arriving at the zoo—African warthogs and critically endangered Visayan warty pigs—so we’re gearing up for some majorly pig-worthy new exhibit spaces. The warthogs will move into the African Savanna biome in the former wild dogs exhibit, and the Visayan warty pigs will have a new home in the Elephant Forest exhibit near the elephant pool. Fencing surrounds the new Visayan warty pig space as the exhibit crew installs gates, watering holes and a mud pit for wallowing. That means a lot of grinding, buffing and roughing is needed to get these new spaces in order. You might not know it, but many of our exhibits are designed and built with our own in-house expertise right here at the zoo. The process starts with animal management and projects staff teaming up to design a safe and naturalistic home for each new animal, and then our exhibits crew takes over. The exhibit shop includes a giant blackboard for drafting out ideas and drawing designs. A lot of creativity and outside-the-box thinking goes into each and every project. Our exhibits crew is made up of a team of highly skilled welders, sculptors, painters, carpenters, designers, drafters, builders, and artists. Although many of them specialize in one specific craft, all of them have to be extremely creative and resourceful to get the job done. Let’s just say that if there were a tree house competition, you would definitely want our exhibits crew on your team! They have to create beautiful exhibitry that is not only safe for the animals, but is durable and weather resistant. Oh, and it has to be green: meaning it uses sustainable materials derived from local vendors if possible. The exhibits shop is located at the heart of the zoo, hidden from view, but central to the upkeep of our bioclimatic zones. The exhibits shop has a carpentry/woodshop, metal shop, paint center and a large backyard for tackling projects too tall to fit inside. Most of the work is done at the shop, but a lot of the finishing details are done in the exhibits, such as painting and installation. The team works closely with animal management, projects and horticulture to ensure that each exhibit mimics the natural landscapes of that biome. Here, you can get a sneak preview of the Visayan warty pigs’ new wallowing hole near the south side of the exhibit. Shaped concrete creates a natural enclosure for the pigs as well as a little place to nap in the afternoon. Tire tracks are seen here, but soon you will see lots of tiny hoof prints! For the Visayan warty pig exhibit, that means creating a densely forested landscape, similar to the Visayan Islands in central Philippines. In the wild, these pigs inhabit primary and secondary forests (from sea level to elevations nearly a mile high) as well as degraded areas of invasive grasslands (if enough dense cover exists). Our crew is creating unique spaces for these three little pigs; resting hollows, watering holes, and wallowing areas. Their new exhibit will also reflect deforestation, including slash and burn piles, which are scattered across the region. Detail of a gate which will be installed at the Visayan warty pig exhibit. There will be 12 gates for these three little pigs. The exhibit team has to create twelve gates for the Visayan warty pigs alone. The fencing and gates are an important aspect of any exhibit, allowing keepers quick access to the animals, but also creating representational fencing that blends into the scenery. Woodland Park Zoo has been a leader in creating exhibit spaces that appear to have little or no barriers between the visitors and the animals. We do this partly by camouflaging trellis and using natural looking material to construct enclosures. This gives both our animals and our visitors a more natural view! Bill cuts strips of lathe, commonly used for plaster walls, which are then wrapped around the steel gates you see in the foreground. Then the exhibits team will cover the entire thing in a high fiber, ‘special zoo mix’ concrete. The concrete cures in about 4-5 hours and will then be painted to match the natural sticks and vines in the exhibit. The gate sections will be covered in an epoxy, instead of concrete, making them much lighter to open and shut easily. The epoxy dries in about three hours. That means the staff has about a two-hour working period to add in the details. They use special polyurethane molds, above, to press into the sticky epoxy to create distinctive textures. Resins are used to cast decorative millwork and architectural elements. Here you can see the various molds for different types of bark. Polyurethane is also used to manufacture hoses and skateboard wheels as it combines the best properties of rubber and plastic, durability and flexibility. The gates and fencing, once painted and finished, will blend right into the exhibit. Here, you can hardly tell where the structural elements of our exhibit meet live plants! We call on the skills of our exhibits experts to create natural habitats that meet the needs of each creature. Quite a change from the old square cages once seen in zoos, our animal containment allows residents to explore a spacious landscape which resembles their natural habitat. Attention to detail is key. Realistic and detailed rockwork, such as this path near jaguars, replicate the textures and colors of the rocks, lichens, moss, roots, stumps, logs, and leaf and footprint impressions found in the wild. We also paint special murals and backgrounds in many of the viewing areas. Our exhibits team uses both conventional and unconventional materials to replicate and enrich each space that they assemble. To ensure a safe habitat for each resident, a deep understanding and study of the animals being placed into the exhibits is a requisite. Our exhibits crew is a big part of what makes this zoo so special. Each biome is designed to engage zoo visitors, helping them to better understand wildlife and the challenges of conservation and sustainability. Take a good look at this gate work. When the Visayan warty pigs debut on May 5, you can visit their new home and see if you can find this same piece once it’s installed on exhibit. Good luck, it will be a lot harder to find once it’s finished! Next time you visit, be sure to pay attention to the details; it’s amazing how much work goes into each and every exhibit. You can check out the beautiful work our exhibits crew does at the new Visayan warty pig and African warthog exhibits which debut on May 5! All photos by Kirsten Pisto/Woodland Park Zoo unless otherwise noted. 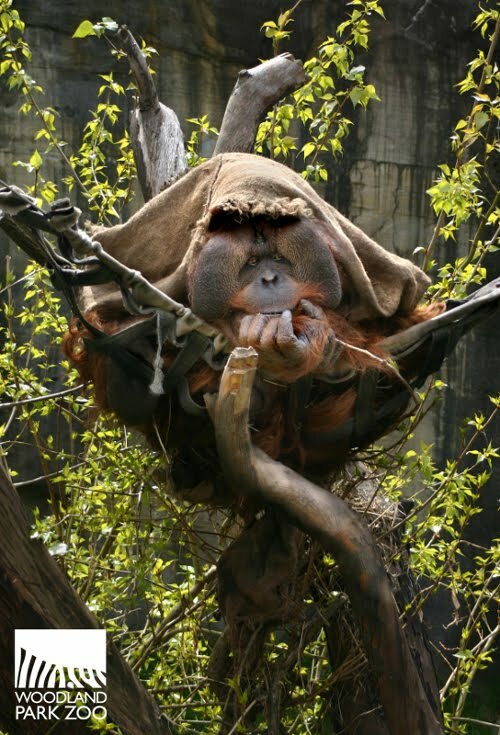 Those burlap bags you often see our orangutans with might seem out of place, but our orangutans use them as they might use leaves in the wild—as blankets, bedding, umbrellas, sun shields and even privacy curtains.